If you go to the trouble of making your dog's treats from scratch, you want him to enjoy them. You may even want to add a dash or two of your favorite spices to enhance the flavor. But then you have to know which spices are safe and decide whether to use fresh or dried. A good rule of thumb to follow when it comes to spicing up your dog's food is: less is more. Or simply use none at all! Read on for more details. Caution: Whether you're looking to add spices to your dog's treats or food for flavoring or for their purported health benefits, you should always consult your vet first. The list of spices safe to feed your dog is a short one. You can feel secure adding spices like cinnamon, ginger, poppy and sesame seeds sparingly to homemade treats. Turmeric has some well-known health benefits, but you should pay attention to proper dosage as some negative side effects have been attributed to it as well. Some dog treat recipes call for fresh garlic or garlic powder, and some commercial dog foods and treats list some form of garlic as an ingredient. But that's a gray area because garlic is from the same family as onions, a well-known toxin for dogs. When in doubt it's always best to play it safe and not add garlic to treats for your dog. He won't mind, and at least you won't be compounding doggy breath by adding garlic to it. Always keep in mind that spices don't make a biscuit any more or less appealing to your dog, and some spices including mace, nutmeg, and paprika can make him sick. Even foods containing dog-safe spices can cause vomiting and diarrhea if the contain too much of them. That said, if you add spice to your dog's treats, always do so sparingly. When it comes to shopping for spices to add to dog treats, neither fresh nor dried is superior. Fresh spice will add more depth of flavor than dried, but the flavor that dried spices provide is more concentrated, so you'll use less. Most of the bigger supermarkets carry a wide selection of dried spices, but very few if any fresh spices, because transportation and storage can affect the flavor and color of fresh varieties. One dog-friendly exception you should be able to find fresh at most stores is gingerroot. 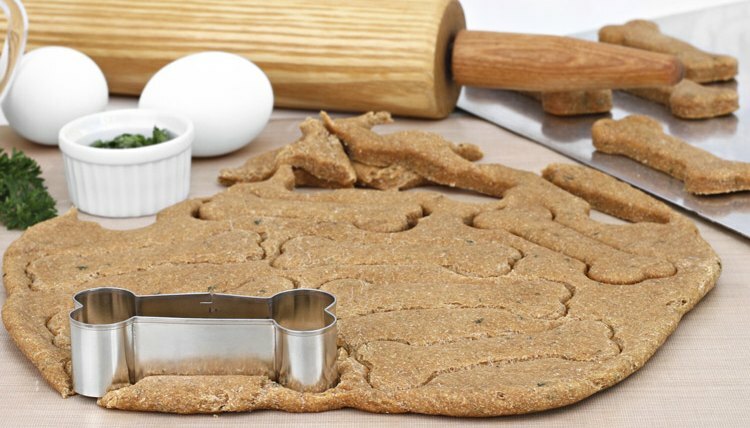 If you think that your canine would enjoy a delicious spiced treat on a festive occasion, you can whip up a batch of cinnamon-ginger biscuits -- perfect for autumn. Note that this recipe contains oats and brown rice, so do not make it if your dog is sensitive to grains. Mix all ingredients until it forms a dough. Roll the dough 1/4 inch thick on a floured surface and cut it into shapes with a knife or a cookie cutter, then place the cookies on a cookie sheet sprayed with cooking spray. Bake the cookies at 350 degrees Fahrenheit for 15 to 20 minutes, then allow them to cool before feeding them to your pooch.